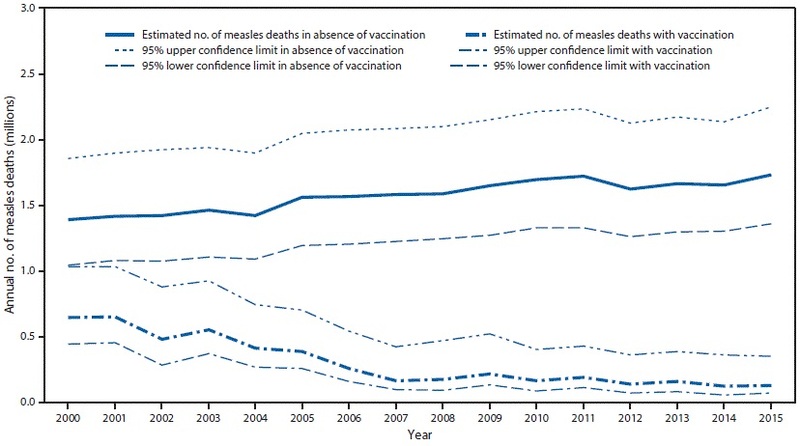 An increase in immunizations is decreasing the number of measles deaths. In 2000, the United Nations assigned measles vaccinations as a progress indicator for its Millennium Development Goal to reduce child mortality by two-thirds by the year 2015. Now, reports generated by the World Health Organization (WHO) and the United Nations Children’s Fund (UNICEF) show that during the period between 2000 to 2015, coverage of MCV1 (the first dose of measles-containing vaccine) increased from 72 percent to 85 percent and measles incidence went down from 146 to 50 cases per 1 million people. This has lead the WHO to estimate that over 20 million lives have been saved thanks to the measles vaccine. Given that 2.6 million people were dying from measles every year as recently as the 1980s, that is a remarkable improvement, but the WHO’s report wasn’t all good news — it also revealed that 134,200 children were killed by measles in 2015.
Credit: Patel MK, Gacic-Dobo M, Strebel PM, et al. Vaccines are already effective when used on individuals, but they truly shine in communities. Members who are unable to get a vaccine (due to various reasons) will still be protected because of the imunized people around them. 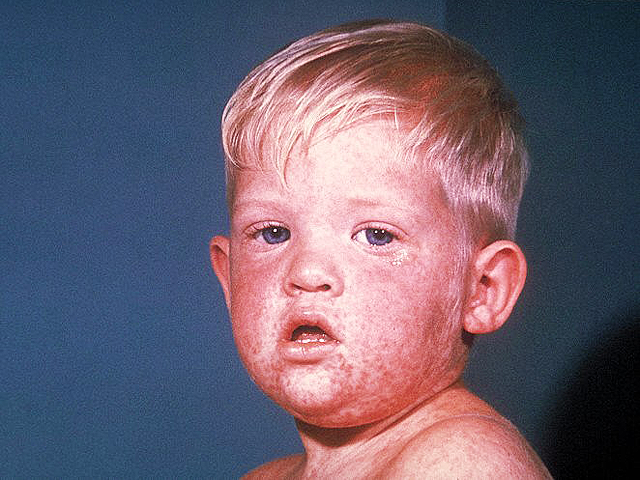 This is know as herd immunity, and it has been so effective at suppressing the disease in some areas that people have forgotten how bad measles could get. Recent outbreaks in the U.S. point to a worrying trend of misinformation and complacency. Some of this stems from the fear that vaccines cause autism. While that theory has been debunked for a long time now, some people refuse to accept that it’s simply unfounded. Ultimately, vaccines save lives, and removing them from modern society would have disastrous consequences. Smallpox was a deadly disease that claimed around 2 million in the course of a year as recently as 1967. Now, thanks to vaccines, it’s completely irradicated and confined to a lab. That same fate could await measles should the whole world become immunized.